Experience our award-winning 55-minute Swamp Buggy Eco-Tour as you immerse yourself into Florida’s natural side. Furthermore, visitors can learn about the fragile ecosystem of the Florida Everglades and the flora and fauna that surrounds you. Our guides will take you on a journey through time while you explore the lush wilderness of Seminole Country. Moreover, bounce and splash through the swamp as you view native and exotic wildlife up-close and in a free-roaming environment. For example, Swamp buggy riders will see an array of native and exotic animals. These include; deer, antelope and bison, many species of birds, rookeries, alligators and hogs. In fact, some lucky guests may get a glimpse of a Florida Panther or Black Bear. Along the swamp buggy trail, guests can visit a Florida Seminole Indian Camp. Here, you can learn about Seminole culture and history. In fact, you can even learn about a few plant uses that were vital to Seminole survival hundreds of years ago. Many are still used today as holistic remedies. Swamp Buggies are open, custom motorized vehicles with a canopy top. They also have powerful tractor tires to move effortlessly through the swamp, while acting as shock-absorption to riders. Thus, the expression “bounce” around on a swamp buggy. 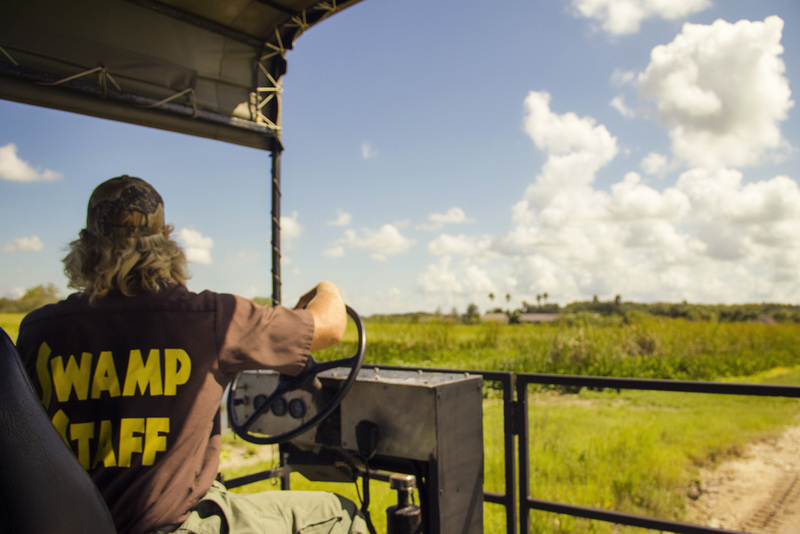 More specifically, swamp buggies are designed to provide visitors with an elevated view of the Florida Everglades. In this environment, swamp buggy vehicles stomp through the wetlands, cypress heads and hardwood hammocks. 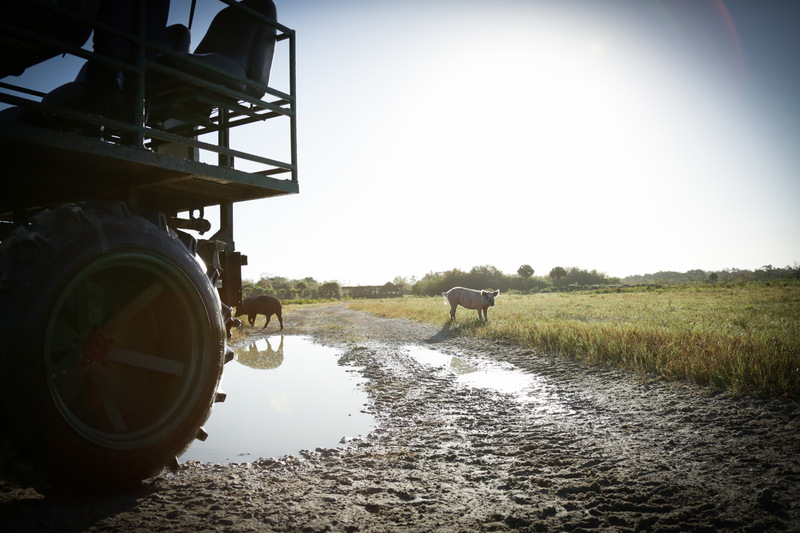 A swamp buggy travels over dry land and muddy marshes, giving you a great view to see plants and animals that an airboat can’t reach. In contrast, on this open ride, you are the one in a “cage,” not the animals. Our Florida Everglades swamp buggies can cross virtually any type of terrain. As such, they give new meaning to the phrase “off-road”. Whether it’s thick marsh, uneven ground, thatch brush or low water passages, you’ll see and experience it all. At the same time, our swamp buggies are built for your comfort and safety. Moreover, our nature tour will provide an intimate look at Everglades plant and wildlife. Most importantly, to give you a Florida Everglades vacation you can cherish for a lifetime. Not recommended for pregnant woman or people with back problems. Children 3 and under are not eligible to ride an airboat. All scheduled times are approximate. Inclement weather may affect tour/ride times. Sorry - NO pets allowed in park (PETS LEFT IN CAR WILL BE REMOVED AT OWNER'S EXPENSE) and no refunds.